TWELVE YEARS! 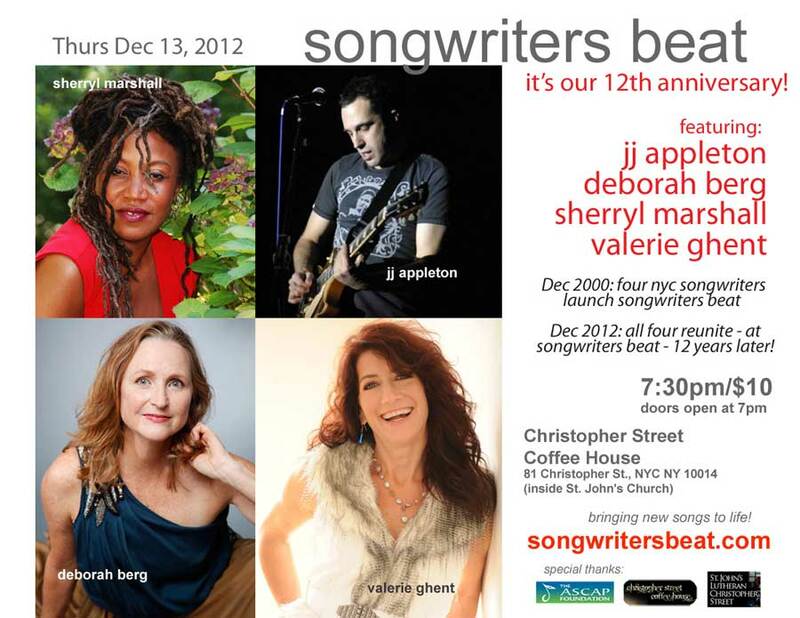 In December, 2000, Valerie Ghent, Deborah Berg, JJ Appleton and Sherryl Marshall launched Songwriter’s Beat with one sold-out concert at Cornelia Street Cafe. Who knew that one fateful night would become a beloved monthly concert series, one which would promote and support hundreds of songwriters from all over the world? And who knew it would still be going strong, twelve years later? I certainly didn’t plan to start a songwriter’s night! Yet since our very first concert, Songwriter’s Beat has grown to feature over 340 songwriters from around the world, produced 150+ concerts and eight songwriting festivals, an ongoing songwriting workshop series, dozens of benefit concerts for a wide variety of causes, started a song contest and fostered the creation of hundreds of new songs! I am both honored and delighted that twelve years later, the four of us – Val, Deb, Sherryl & JJ – will once again share the Songwriter’s Beat stage. We’re still making music and writing new songs, right in the heart of Greenwich Village. It feels all the more fitting when viewed within the Chinese calendar: we began in the Year of the Dragon, and 12 years later we reunite, once again in the Year of the Dragon. 12 years! My god so much has happened – we have new albums, children and even grandchildren since our debut. Parents, grandparents, family and friends have passed away. 9/11, Katrina and Sandy have become words in everyday parlance. Three elections have changed our nation. And still we write songs! I strongly believe that keeping live music alive and providing a creative space for songwriters and new songs is essential. Both for the health of songwriting and songwriters – to have a collective space in which to come together, listen to and support one another – and for listeners and music lovers to hear new, vibrant, original music, literally ‘hot off the presses’. Essential for the cross-pollinization of artists and audiences. Vital for world-class, undiscovered music and radio-ready artists to have the chance, the opportunity, to be heard. The importance of live music grows ever-stronger as venue after venue has shut their doors here in New York City. The importance of ORIGINAL live music has become crucial as we are overwhelmed by increasingly homogenized radio and television, whether it be via the internet, satellite or traditional airwaves. I give thanks to the many wonderful people who help me keep Songwriter’s Beat alive and strong: our dedicated audiences, the hundreds of songwriters who have graced our stage, our loyal friends and fans; Bill Grady, Deborah Berg, Deni Bonet and Jon Albrink for additional hosting; Tomas Doncker, Pantera Saint-Montaigne and Bill Grady (again!) for helping to produce our annual songwriters festival; Ron Frary for videotaping so many of our shows and putting our concerts on YouTube, The ASCAP Foundation for its ongoing support; Christopher Street Coffee House and St. John’s Church for being our ‘home away from home’ with such beautiful acoustics and sheer love of live music. By coming to Songwriter’s Beat each month YOU help to keep live music alive in New York City – thank you! JOIN US December 13th TO CELEBRATE! Notes: Songwriter’s Beat 12th Anniversary! w/ Valerie Ghent, Deborah Berg, JJ Appleton, Sherryl Marshall. 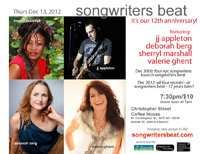 COME CELEBRATE 12 YEARS OF PERFORMING SONGWRITERS & HUNDREDS OF NEW SONGS!